« How to make your own Clotted Cream…..Mmmmmm! Porthleven, near Helston is the most southerly port in the UK and was originally developed as a place for boats and their crew to shelter when it was rough at sea. Porthleven is a lovely little Cornish harbour with a great community with many independent shops, galleries, pubs and restaurants and is well worth an afternoon’s visit. When there are strong South westerlies the harbour gets a phenomenal pounding from the Atlantic and my advice would be to either stay away or watch from a distance!! This video will give you an idea of the immense power of the waves that hit this little harbour. Well done to the brave cameraman for shooting this footage, i’ve stood where he was whilst filming this and you are lucky if you can stand upright! Also check out this incredible picture of a wave hitting the coast of Porthleven on the Mail website, its massive! Porthleven is a beautiful place and a popular place for an afternoon stroll. This picture was taken on the 1st January 2010 whist out with my family. I love the light on the pier, the people spaced out along it and the few surfers waiting to catch a slightly smaller wave! 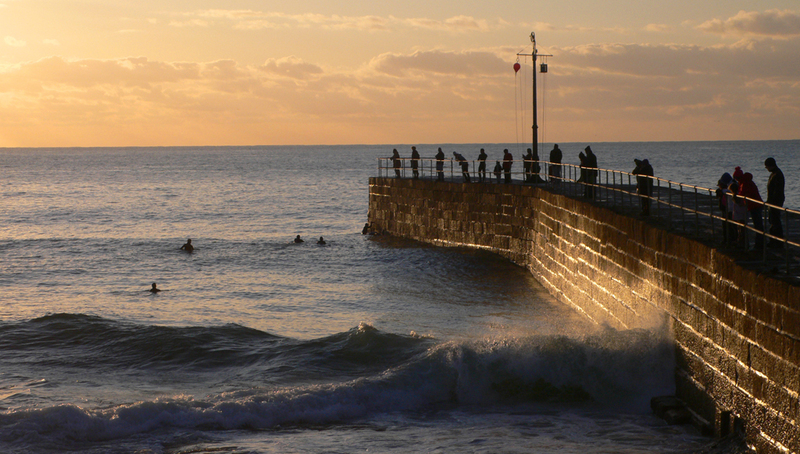 To find out more about Porthleven, places to visit and places to eat check out their community website here.